Here's the plan for the day. It's not easy getting organized, but it really does help when I start to get tired! In case you can't quite read my notes, I'm exploring how best to store dodder to use later in the year. 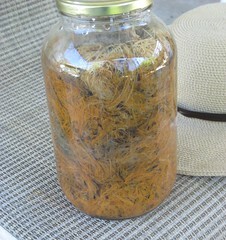 Bjo has said that dried dodder doesn't give color, and that's been my experience also. But I thought I'd try frozen and canned dodder too. 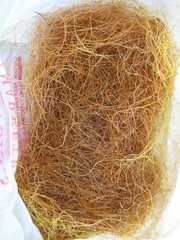 I got this dodder from the field shown at top. 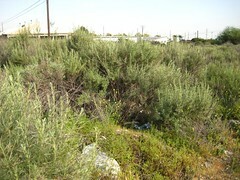 It's dried for just over a week, in the back yard, with about 2 hours of afternoon sun per day. When I weighed it as fresh, it was 6 ounces. In the dried state here, it's 1.75 ounces. It's not completely dry-- I think that if I sealed this in a plastic bag it would still mold. My Roketman volunteered to go get the dodder toooday, after wagging a finger and scolding me (in jest, of course!) about tweaking my heel yesterday. I think this is at least a pound, if not two! I weighed out 8 ounces to use fresh today. You can dyestuffs just like food, only you don't have to be careful at all about sterility or acidity. All you need to do is a water bath and bring the internal temp up to at least 160F, turn off the heat, seal, and make sure the lid pops down. Look closely at the color - I noticed that the sunlight seems to fade the dodder. The inside was much brighter. This is from the dyebath at the last Dye Day, so it's not entirely "new". 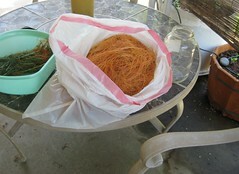 But there was a lot of dodder in the pot incomparison to fiber, and I think there's still a lot of color. Here's how to cope when you have four dyepots for three burners. 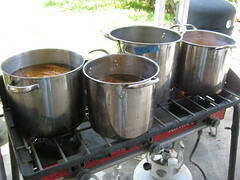 I did keep an eye on temps, and rotated the pots as necessary. After I took this picture, I labeled the pots with some blue painter's tape and indelible marker. They do look pretty similar, and I know my tendency to lose track. Here's the results. I've got pictures of each dyepot in the Flickr set, because I decided they were a bit too repetitive to put here. Besides, not everyone is as interested in the obsessive details as I am, right? These two skeins came out of the dyepot noticeably different -- and the only difference is that they came from different fleeces. Both were romney, both white. Fascinating! This picture isn't the best, but I wanted the tags to show. The skeins are much more green than shows here, in the teals. 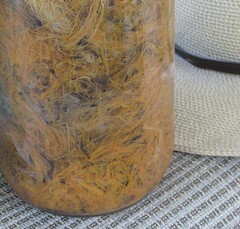 Notice how much more green the dried dodder overdyed with indigo is! 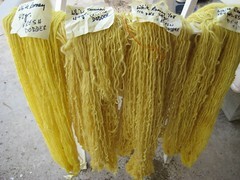 Now go look at the yellow skeins. Who would have thunk. My conclusions? I think that if you want the best and brightest yellow, you ought to use fresh dodder. If you want to overdye, it really doesn't matter as much. 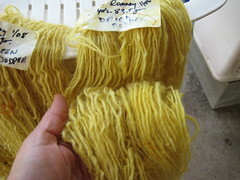 I was suprised at the difference that the wool makes -- look at the dried dodder with two different romney fleeces. Same dye, same pot, same everything except fleeces. I'm going to do a lightfastness test on this. One of my goals is to do some sort of portfolio, and this would be an ideal entry. Well, as far as inexplicable knitter behavior on April first, the best I've come up with is Chicken Sox. As in, if chickens wore socks, what would they look like? I could knit a cozy for something strange, but what. This is Southern California, not much need for cozies. And inexplicable is standard operating procedure around here. I should post that picture from the Pomona Yarn Lovers meeting on Wednesday at lunch. Marianne was knitting a hat, and put it on her head with needles sticking out of it. That's pretty inexplicable to non-knitters. I've gotten puzzled looks when I try on gloves-in-progress, with dpns sticking out like a horror-movie prop. Hi! I'm knitting gloves for Freddy Krueger! I wonder what would happen if I search "inexplicable knitter behavior -harlot" (the minus sign eliminates the Harlot from the results). Aww, there's the Bittersweet Blog. It's got some really cute amigurumi-type softies. It's almost as strange as the Anti-Craft. Who can forget Baby's First Teratoma? I think strange has been done. Now, if I did something wired... like Leah Buechley's projects. I think I need to work on this some more. In fiber progress: no more combing Stardust for the past couple nights. However, since the Libraries are closed tomorrow for Cesar Chavez day (he's noted in California for unionizing the farm workers), I'm throwing a Dye Day in his honor. No lettuce*. Dodder in the dyepot. Trouble is, I tweaked my Achilles' tendon pretty badly when I was out gathering the dodder. Silly me, I thought the sandals would be stable enough to clamber around an abandoned field. In other news, I pulled out the entirety of the RocketGansey-dottir, because it was measuring 64 inches instead of 60. Remember City Slickers? Do-over! *For anyone not in California in the 60s, there was a lettuce boycott to help support the farm-workers. The Yarn Harlot has this post about Inexplicable Knitter Behavior, and then goes on to call a Knitter's Treasure Hunt in Toronto on April first. Finally, there will be a Freestyle category. You can take any sock picture (In Toronto, on April 1st) that you think will amuse or entertain me, because there have just got to be a thousand things that are a killer sort of brilliant that I didn't think of. Obviously, I'm in Los Angeles, NOT Toronto. But I really want to come up with a knitted something to post a picture. A sock for a statue, perhaps? For my ever-so-patient Pyr? Or perhaps that tree on campus that looks like it's wearing a bikini. Socks for an octopus? (knitted, of course) What would chicken socks look like? I've combed 25 1/2 ounces. I am possessed. 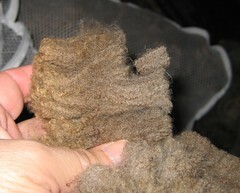 Here's a shot of the fleece I'm currently working up. The name of the sheep is Stardust, a merino/Finn/something cross. 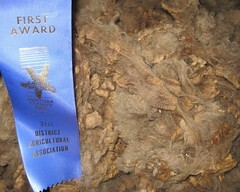 As you can see, she got a Blue Ribbon at the Ventura County Fair! 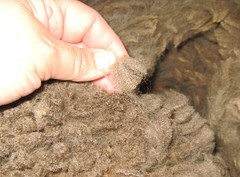 Before I wash this fleece in batches, I go through looking for second cuts. This happens when the shearer takes a second pass with the shears, and the lock gets cut shorter. It also makes for pills and neps (knotty places) in the yarn. Here's a really good shot of how the second cuts make the locks shorter. I can work with this, but the really short cuts go on the compost pile. I left out a bit of back story on the RocketGansey-dottir... I'm basically doing the same thing as the Rocket Gansey as far as pattern and fit. But where the heck did I put my notes from last time? Here's a bit of digression. 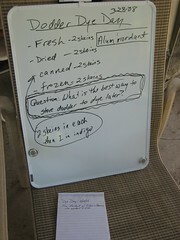 Those of us knitters who have been around a while tend to snicker at the questions of the really clueless newbies. (and if you're smart enough to wonder if that means you -- don't worry, it doesn't!) I'm talking about questions like "What would this sweater look like in blue?" So, when I realized that we were going to Quartzsite on Saturday instead of Sunday (and this was on Friday afternoon!) I realized I needed to cast on RIGHT NOW! in order not to break my cardinal rule. You know the one - if I cast on while on a trip, it just won't work. Something will go wrong and I'll have to rip it all out. So where the heck were my notes from the last Rocket Gansey?? I tore the house apart, and I couldn't find it. I finally posted to Sheep Thrills, with the subject line: BTKE (Because Thrillers Know Everything): calling the psychic knitter thriller! Where the he** did I put my notes on the Rocket Gansey?? Over there. Next to that thing. sigh. I finally found the original email and printed that out.